Sol. Indian Overseas Bank is a major public sector bank based in Chennai, Tamil Nadu. Sol. 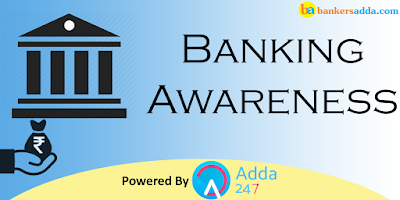 Dena Bank, in July 1969 along with 13 other major banks was nationalized and is now a Public Sector Bank constituted under the Banking Companies (Acquisition & Transfer of Undertakings) Act, 1970. Under the provisions of the Banking Regulations Act 1949, in addition to the business of banking, the Bank can undertake other business as specified in Section 6 of the Banking Regulations Act, 1949. The Headoffice of Dena Bank is in Mumbai, Maharashtra. Q3. Hyderabad is the headoffice of which of the following banks? Sol. Hyderabad is the headoffice of Andhra Bank. Q4. Which Bank's headquarter is located in Mumbai? Sol. The headquarter of Union Bank of India is located in Mumbai. Q5. The Oldest Joint Stock Bank of the Country, Allahabad Bank was founded on April 24, 1865 by a group of Europeans at Allahabad. Where is the head office of Allahabad Bank? Sol. The Oldest Joint Stock Bank of the Country, Allahabad Bank was founded on April 24, 1865 by a group of Europeans at Allahabad. At that juncture Organized Industry, Trade and Banking started taking shape in India. Kolkata, West Bengal is the head office of Allahabad Bank. Sol. Corporation Bank is a public-sector banking company headquartered in Mangalore, India. The bank has a pan-Indian presence. Q7. Gurugram, Haryana is the headoffice of which of the following banks? Sol. Gurugram, Haryana is the headoffice of Oriental Bank of Commerce. Q8. Which Bank's headquarter is located in Manipal, Karnataka? Sol. Syndicate Bank was established in 1925 in Udupi, the abode of Lord Krishna in coastal Karnataka with a capital of Rs.8000/- by three visionaries - Sri Upendra Ananth Pai, a businessman, Sri Vaman Kudva, an engineer and Dr.T M A Pai, a physician - who shared a strong commitment to social welfare. The headquarter of Syndicate Bank is in Manipal, Karnataka. Sol. Bank of Maharashtra is a major public sector bank in India. The headoffice of Bank of Maharashtra is in Pune, Maharashtra. Q10. Union Bank of India is one of the largest government-owned banks of India. Where is the head office of Union Bank of India? Sol. Union Bank of India is one of the largest government-owned banks of India. Mumbai is the head office of Union Bank of India. Q11. New Delhi is the headoffice of which of the following banks? Sol. New Delhi is headoffice of both Punjab National Bank and Punjab and Sindh Bank. Q12. Which Bank's headquarter is located in Kolkata? Sol. United Bank of India is an Indian government-owned financial services company headquartered in Kolkata. Sol. As a premier commercial bank in India, Canara Bank has a distinct track record in the service of the nation for over 111 years. Today, Canara Bank has a strong pan India presence with 6111 branches and 10339 ATMs, catering to all segments of an ever growing clientele accounts base of 8.05 crore. Across the borders, the Bank has 8 branches, one each at London, Leicester, Hong Kong, Shanghai, Manama, Johannesburg, New York and DIFC (Dubai) & a Representative Office at Sharjah, UAE. Canara Bank based in Bengaluru. Sol. Central Bank of India, a government-owned bank, is one of the oldest and largest commercial banks in India. It is based in Mumbai which is the financial capital of India and capital city of state of Maharashtra. Q15. Chennai is the headoffice of which of the following banks? Sol. Chennai is the headoffice of Indian Bank and Indian Overseas Bank.